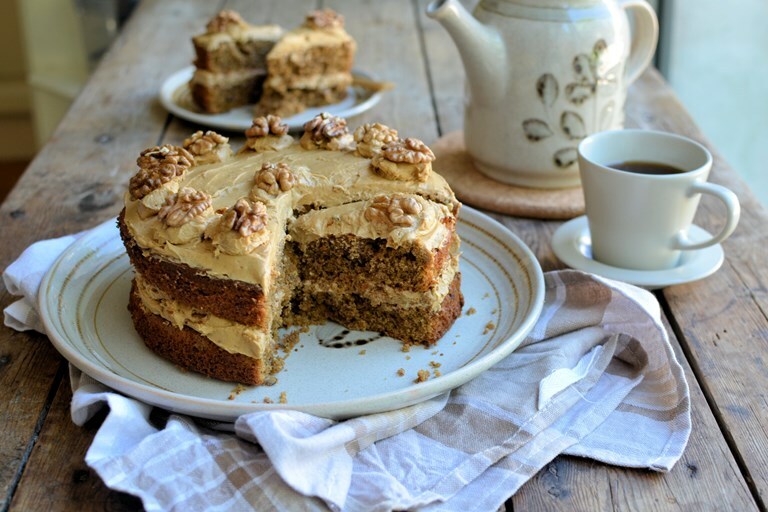 What could be better than a classic coffee and walnut cake? Karen’s recipe is true to the delectable classic, ensuring a magnificent centrepiece to any afternoon tea. Karen advises using the best instant coffee you can get your hands on – it will make a huge difference to the final flavour. I always think that where the French are good with patisserie, we in the UK cannot be beaten when it comes to puddings and cakes; cakes in particular are a specialty of British baking, and with the start of a new season of Great British Bake Off this week, I suspect there will be many home bakers making their way to the kitchen, to sift the flour and beat some eggs! We are a nation of cake lovers . . . old family favourites are the ubiquitous Victoria sandwich, Lemon drizzle cake, Madeira cake, Chocolate cake and Coffee and walnut cake, which is a personal favourite of mine. 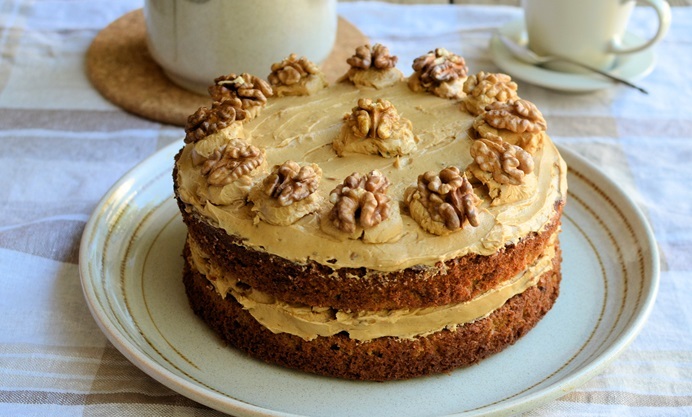 There’s something very ‘ye olde worlde tea room’ about a lovely coffee and walnut cake, it beckons all cake and coffee lovers with its creamy good looks, and it’s the mainstay of the afternoon tea table. I remember a wonderful old tea room in Yorkshire, near to where I used to live – they always had a least four home-made cakes on offer, of which a grand coffee and walnut cake would be sitting amongst a fresh orange cake, chocolate cake and always a farmhouse fruit cake or Dundee cake. Although I was always tempted by the fresh orange cake, it was invariably a slice of coffee and walnut cake that made its way to my table with a pot of tea or cup of coffee! Today’s recipe for Coffee and walnut cake is based on my mum’s recipe that she used to make for Sunday tea, but I’ve increased the quantities to make a large cake that will serve twelve people with ease (12 slices). Don’t forget to use the best quality instant coffee you can lay your hands on, as that makes a difference to the taste.